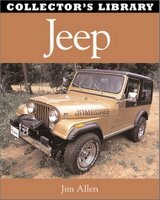 Jeep car books covers the history and development of the Jeep and Willys-Overland Jeep. Jeep is now an automobile marque of Chrysler. It is the oldest off-road vehicle brand. From 1941 to 1953 Jeep was owned by Willys-Overland, later by Kaiser-Jeep and AMC before Chrysler in 1987. 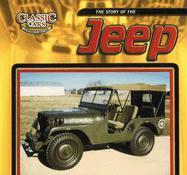 Jeep: The Fifty Year History by Robert C Ackerson (1988) traces the origins, development and different types of Jeep. Jeep CJ 1945-1986 by Robert C Ackerson (2006) is devoted to the story of the CJ Jeep. It has a detailed, carefully researched text, full colour illustrations and charts illustrating the specs and options of all CJ model from the CJ-2A to the CJ-7. It provides readers with the story of the CJ's origin, its early popularity as a utility vehicle and its evolution into a rugged 4X4. 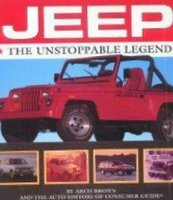 Jeep: The 50 Year History by Beki Adam (1988) traces the heritage of those vehicles from the Jeep's prewar genesis through the 1988 model year models. Over that time span, which comes close to half a century, the basic Jeep character traits of honest design, versatility and a penchant for hard work remained in tact. This book celebrates that achievement. 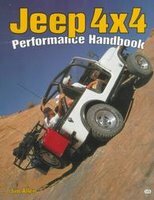 Jeep 4x4 Performance Handbook by Jim Allen (1998) debunks the myths and eliminates the mystery of getting the most out of your Jeep through the thorough research and expertise of author and Jeep expert Jim Allen. He explains the bolt-on parts, swaps, and modifications that will give the most bang for the buck, whether you hit the trail in a CJ or a Wrangler (TJ and YJ), a Cherokee, or a Liberty, or one of the many classic and vintage Jeeps available. From bumper to bumper, this book covers it all, improving street performance and off-road toughness, towing ability and suspension, brakes and electrical systems, and the all-important safety equipment and modifications. Half-Safe: Across The Atlantic In An Amphibious Jeep by Ben Carlin (1955) tells the story of 'Half-Safe', an amphibious jeep in which the author and his wife, crossed the Atlantic on the first lap of their journey round the world. It was half the size of the smallest powered vessel ever to have made the crossing until the Carlins' did so - and the only car to have done it under its own power. This book describes the journey from Halifax, Nova Scotia to England, where the Carlins' had to settle for a while in order to renovate the jeep and raise money for the next part of their journey. 'Half-Safe' was no larger than an ordinary jeep and with her square superstructure and the bits and pieces that she carried she looked something between a hen-coop and a gypsy caravan. But 32 days later she trundled ashore in the Azores. By then they thought they had proved how good 'Half-Safe' was, but the real test came during the next stage - from the Azores to Madeira. Instead of an easy nine to ten days run, they had a hellish twenty-three days of storm and hurricane. It is not easy to convey the sensations of riding such a storm in a car, but Ben Carlin does it. From Madeira they crossed to Africa, arriving at Cap Juby on the fringes of the Spanish Sahara. Their desert drive was hazardous and the reader shares the Carlins' relief when they reach Europe at last and have only to contend with the more familiar perils entailed by being broke. Carlin's direct and racy style, his wry understatements and his humour have turned his journey into one of the best adventures stories of the time. Jeep by John Carroll (2000). This illustrated account of the extraordinary career of the Jeep takes the story from the early 1940s to the turn of the century. Historical photographs collected give a keen insight into the thinking behind the Jeep and its consistent development into the rugged, functional off-road machine it has become. This text should be of interest to Jeep owners and enthusiasts, and to all whom are interested in the story of four-wheel drive. The Jeep was conceived as a simple, robust, light utility vehicle for the Allied armies of World War II. Since then, it has efficiently served the same purpose during subsequent conflicts all over the world. Carroll illustrates this familiar aspect of the story with unusual shots of the Jeep at war in the Pacific, Britain, mainland Europe and the Far East. He also shows how, after World War II, the Jeep continued as a functional, go-anywhere vehicle for farmers, ranchers and any individual or organization who lived or worked off the beaten track. 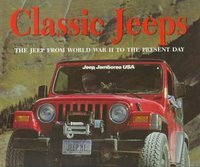 Classic Jeeps: The Jeep From World War II To The Present Day by John Carroll (2000) traces the history of the Jeep from the delivery of the first Jeeps to the allied military in 1941 through to the changes of ownership in the fifties, sixties and seventies to the end of CJ production and the new style Cherokee. Africa In A Jeep by Joe Ceurvorst (1956). An African journey in a Jeep commencing in Algiers down to Lagos across to Nairobi and up to Tunis via Cairo. 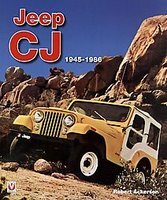 Jeep Wagoneer Performance Portfolio 1963-1991 by R M Clarke (1999) is a compilation of road tests and articles from major automotive magazines worldwide. Jeep CJ5 And CJ6: 1960-76 (Brooklands Road Tests) by R M Clarke (1990). Articles including off road tests, performance data, new model reports, Tornado OHC, Renegade, Universal, CJ5, CJ6, CJ7, Camper. Jeep Cherokee & Grand Cherokee 4x4 1992-98 Performance Portfolio by R M Clarke (1999). Road & comparison tests, performance and technical data, buyer's checklist, new model introductions, specifications. Models: Country, Grand Cherokee, Laredo, Grand Wagoneer, Orvis. Jeep by Michael Clayton (1982). The story of the development of this fascinating vehicle. A rare book. Indestructible Jeep by D Denfeld & M Fry (1973). History of the Jeep. One of the rarest of the Ballantine Books. 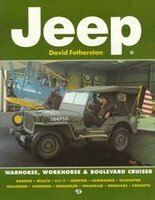 Jeep: Warhorse, Workhouse & Boulevard Cruiser by David Fetherston (1995) is a visual celebration of the Jeep phenomenon which includes: Bantam, Willys, CJ1-7, Jeepsteer, Commando, Gladiator, Wagoneer, Cherokee, Scrambler, Wrangler, Renegade and Concepts. 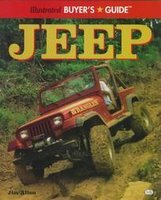 The Story Of Jeep by Patrick R Foster (1998). Expert Jeep historian and former Jeep salesman Patrick Foster uncovers 60 years of Jeep development with dozens of rare and unique photos plus a complete historical background of today's Cherokees, Wranglers and Grand Cherokees. Discover early Jeep prototypes, Jeeps of the future and a special chapter on the most desirable and collectible Jeeps, of particular interest to collectors. Every Jeep made, model by model, is completely detailed and illustrated for simple identification and reading enjoyment. 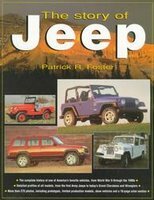 Standard Catalog Of Jeep 1940-2003 by Patrick R Foster (2003). Jeep is an American icon. It maintains tremendous popularity with a half million new Jeep owners each year. This standard catalog covers every civilian Jeep model produced since the 1940s, with photographs, detailed technical specifications, corporate and product developments and historical notes. Coverage of specifications includes vehicle identification number decoding, original factory pricing shipping weight, production total, and engine, transmission and chassis options. Special chapters discuss prototypes, specialty models, concept cars and Jeep models built overseas. Old Cars Price Guide editors provide collector prices for each model in six conditions. Jeep Goes To War by William Fowler (1993) ia an illustrated history of the Jeep and its variants from World War Two to the First Gulf War. 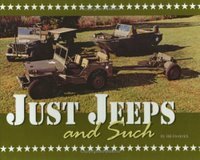 Just Jeeps And Such by Bill Frederick (2001) covers the restoration of Ford GPW, Ford GPA, Willys MB, Willys M38, 37mm anti-tank gun and Bantam trailer. This is a quick overview with emphasis on design and production of WW2 Jeeps. The Jeep by Jean-Gabriel Jeudy & Marc Tararine (1981). There is something irresistible about an idea whose time has arrived. The idea for the Jeep is almost as the motor vehicle, but it was not until 1940 that everything came together and quite suddenly the nimble little car was launched on a career which had a not inconsiderable influence on the course of World War II. The authors of this book give us a striking example of a precursor of the Jeep in France as early as 1906. During World War I the Model T Ford successfully performed the kind of task at which the Jeep excelled 30 years later. There were some exotic excursions up blind alleys with devices like the Motor Cart and the Belly Flopper. 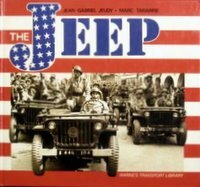 The Jeep: Its Development And Procurement Under The Quartermaster Corps, 1940-1942 (1943) CD ROM. This is a history of the origin and development of the Jeep. The document discusses procurement and the fight for contracts, two adaptations of the Jeep (4-wheel steer and amphibious), and the Jeep in the postwar (possible civilian uses - procuring jeeps commercially and Jeep on the farm). Jeep Owner's Bible: A Hands-On Guide To Getting The Most From Your Jeep by Moses Ludel (1992) provides guidance on preventive maintenance for Jeep owners, as well as a history of the Jeep, off-road operation, tips on buying a new or used Jeep and step-by-step service instructions. Beijing Jeep: The Short, Unhappy Romance Of American Business In China by Jim Mann (1989) traces the history of the stormy romance between American business and Chinese communism from its origins in the 1970s through the stunned foreign exodus after the Tiananemen massacre. The story is told through the experiences of American Motors and its operation in China and follows AMC executives as they quickly learned the Chinese market was not theirs for the taking and of their painful, often absurd, misadventures in a country inherently suspicious of strangers. 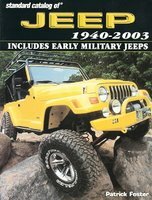 The Story Of The Jeep by Jim Mezzanotte (2005) surveys the history of the vehicle designed for the United States Army in 1940 by the Willys-Overland Company. 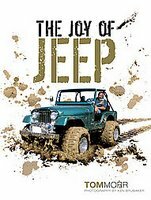 The Joy Of Jeep by Tom Morr (2007) explores the joys of Jeep ownership, history, restoration, modification, off-road competition, events, clubs and more. It includes information on popular accessories and performance enhancing modifications, the different generations and styles of Jeeps, off-road events and the professionals who compete in them. The Military Jeep Complete: Willys MB / Ford GPW : All Three Original TM's In Full (1971) includes all three original TM's in full. Part One: Operating Instructions, Vehicle Maintenance Instructions. Part Two: Technical Manual 9-1803A, Engine, Clutch assembly, Part three: Technical manual 9-1803B, Power train, Body and frame, Special tools and deep water fording. Jeep: Mechanical Mule To People's Plaything by Henry R Rasmussen (1987) is a wonderful book for Jeep enthusiasts. Packed full of quality photos. Covers models from Bantam to CJ5 and Wrangler. WW2 Jeep Military Portfolio 1941-1945 by T Richards (1993) traces the evolution of the WW2 Willys MB & Ford GPW jeeps. It includes driving impressions, service data, history and a report of the Seep amphibian. Filled with black & white photos and illustrations. A very interesting book that all Jeep lovers must have! Off Road Jeeps: Civilian and Military, 1944-1971 by T Richards (1985)is a book of contemporary road tests, technical data, model introductions, military details, camouflage painting, operating details, history. Models covered include CJ-2A, CJ-3A, CJ-5, M38, CJ-3B, M606, 381A, 28, 29, 606A2, 606A3, 170, 422, 151. 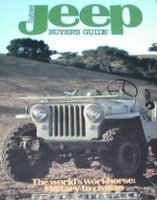 Illustrated Jeep Buyer's Guide: The World's Workhorse Military To Civilian by Peter Sessler (1988) is the information resource on all Jeep models from 1940 to 1999. With such longterm and widespread popularity, Jeeps, new and old, are still much sought after today. This book offers history, technical specs, options lists and even production information on virtually every 4x4 and 4x2 Jeep model ever produced. Jeep: 1941-2000 Photo Archive by Peter Sessler (2000). 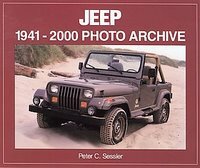 This grand collection of archive photographs illustrates the complete evolution of Jeep, including the early Jeeps (CJ2, 3, 7 and 8, and Wrangler), Jeepster, Jeep Station Wagon/Sedan Delivery, Jeepster Commando, Wagoneer/Grand Wagoneer, Cherokee, and the popular Grand Cherokee. Also features Jeep trucks - the FC, Gladiator, J10 and J15. Contains extensive production figures and specs. 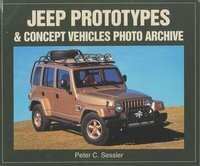 Jeep Prototypes & Concept Vehicles: Photo Archive by Peter Sessler (2000). Included are the familiar CJs, the Wranglers, the Jeep truck, Wagon, Jeepster, Jeepster Commando, Wagoneer, Grand Wagoneer, Cherokee and the extremely popular Grand Cherokee. Exquisite photographs display all of these rugged Jeeps from concept car to prototype to final production model. Early military models are also featured, as well as significant show cars. 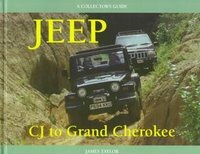 Jeep CJ To Grand Cherokee: A Collector's Guide by James Taylor (1999) reveals all of the consumer models, from the wartime derivative CJ to the latest Grand Cherokee, one of today's bestselling luxury SUVs. After reviewing the Jeep's World War II genesis, author James Taylor examines the many CJ models which retained the basic military concept while refining it into the relative luxury of the latest Wrangler. The current range of SUVs and their growing emphasis on performance is described in depth, as are the Jeep concept vehicles that have garnered accolades at international motor shows. The main text is supplemented by appendices offering technical specifications, production numbers and performance figures. 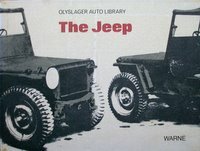 The Jeep by Bart H Vanderveen (1970) covers the war time Jeep and its variants in the Olyslager Auto Library series. 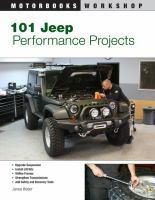 101 Jeep Performance Projects by James J Weber (2009) shows how to get the maximum performance from a Jeep, be it for off-roading, driving to work, or a weekly trip to the supermarket. This book takes the reader through a host of projects to improve their Jeep's performance, describing the difficulty level, estimated cost and time, tools needed for each project. 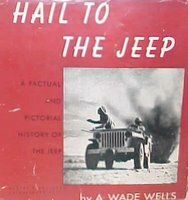 Hail To The Jeep: A Factual & Pictorial History Of The Jeep by A Wade Wells (1946). Detailed story about the development of the Jeep. 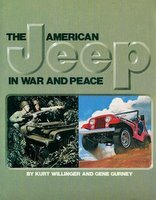 The American Jeep In War And Peace by Kurt Willinger & Gene Gurney (1983) is a visual history of the Jeep from its WW2 origins; military role and post-war developments and civilian versions up to the 1980s CJ. 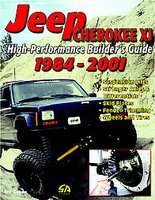 High-Performance Jeep Cherokee XJ Builder's Guide 1984-2001 by Eric Zappe (2006) isn't about cutting apart your Cherokee to build an over-the-top, off-road-only rock crawler (though you can take it there), and it isn't about building a jacked-up, chrome-covered show rig either. This book is about building a useful, capable Cherokee for mountains, the mud, the desert, the street and everywhere in between. With the modifications explained on these pages, your Cherokee can take you and yours just about everywhere you want to go - and get you back safely. Author Eric Zappe explains how to upgrade your Cherokee's suspension, axles, differentials, engine, transfer case, wheels and tires, skid plates, and more, using aftermarket and salvage yard upgrades. Zappe even has special sections covering basic driving and recovery techniques, and a number of built-up Jeeps to give you ideas for your own Cherokee. 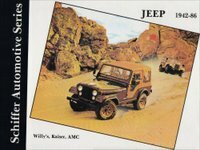 Jeep: Willy's, Kaiser, AMC, 1942-1986 by Walter Zeichner (2004), Each classic model is presented in its historic and developmental aspects. Jeep Industrial Engine (1965). Repair manual for industrial type engines including 4 cylinder L head and 4 cylinder F head cross cut & exploded views. Willys-Overland Visual Education Service Chart Letters. Willys-Overland dealer's service manual containing all 33 troubleshooting Visual Education Service Letters. Each letter follows step-by-step problems and things to check to correct them. 1982 Jeep Wagoneer (1981) American Motors Corporation sales brochure. Jeep: The Toughest 4-Letter Word On Wheels (1971) Sales literature for the 1971 line of Jeep automobiles by American Motors. Jeep Vehicles Are Doing Australia's Work: Australia's Most Useful Vehicles (c.1960) by Willys Motors Australia Pty. Product brochure with 11 model illustrations, vehicle features & specification chart. Willys 77 Operation And Care (1933). Numerous plates and diagrams explain the maintenance and operation of the vehicle. Willys Overland Whippet Six - Operation and Care (2009) Service Manual for 1929 Willys Overland Whippet Six. Willys-Overland Service Update Letters (1925). 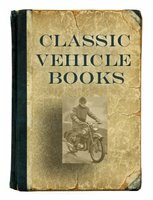 Full-leather three-ring binder containing a collection of hundreds of service letters and illustrations concerning maintenance, repairs and problems encountered with Willys-Overland vehicles, dating from 1925 through 1927. There are also numerous repair update sheets from individual component manufacturers that contributed parts to building these vehicles.